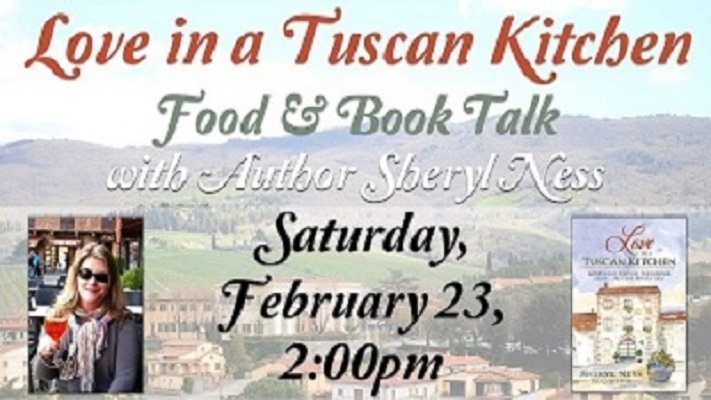 Love in a Tuscan Kitchen author Sharyl Ness will share her remarkable journey of discovery at the Safety Harbor Public Library on Saturday, February 23 at 2:00 pm. In a real-life fairy tale, Love in a Tuscan Kitchen, is the story of how Sharyl fell in love with Vincenzo, a chef in a quaint Tuscan kitchen, over his decadent hot chocolate cake. The memoir transports the reader to cobblestoned streets, lush hillsides dotted with grapevines and olive trees, and unique characters that create the backdrop for this Italian love story. Interspersed within the memoir’s pages are traditional Tuscan recipes that flavor and bring to life the picturesque village of Chianti. Books will be available for sale and signing.